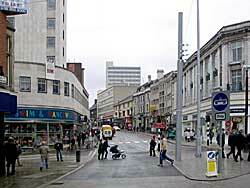 Friar Lane from South Parade (A Nicholson, 2004). It should be borne in mind that these notes were written before the recent alterations to the neighbourhood were contemplated. Friar Lane is now (1931) completely changed. Park Street and Friar Lane may be taken as one and the same thoroughfare for they are indeed merely names for the two ends of the same street. It is an extension westward of the secondary road which skirted the northern rampart of the primitive enclosure of Nottingham and after passing along South Parade forced its way through until it joined the ancient Houndsgate route at the bottom of what is now Standard Hill. The history of its names is obscure and somewhat difficult to understand, apparently in 1336 it was called Moot Hall Gate from the fact that somewhere in it was situated the Moot Hall of the French borough. Where this hall was is not clear. Traditionally it is said to have stood upon the site of the Old Moot Hall public house at the corner of Wheeler Gate and Park Street, but there is a strong body of antiquarian opinion in favour of the Friary in Friary Yard being the position that this ancient building occupied. Apparently this name was applied to Friar Lane right down to Thoroton's time, but towards the end of the 17th century it was changed into Wooler Lane, while the northern half of the street was called Friar Lane. For some mysterious reason the name of Wooler Lane has disappeared, the southern half has become Friar Lane while the northern half is called by the perfectly modern name of Park Street. Up till the early part of the 18th century it was not extensively built upon at its northern end for pictures of Collin's Alms Houses made directly after their erection show it to have been little more than a country lane, while the well-known plan of Nottingham dated 1744 shows a few buildings in the quadrant at present forming Castle Place and a field and paddocks from about where the Friends' Meeting House now stands onwards. This is all the more difficult to explain because in 1926, while the southern side of the road was being set back, several cellars, some of which contained medieval pottery, were discovered under the old houses. There is a great deal of interest in the street although its widening has destroyed a very great deal of its antiquarian interest. Number 46 was the first home of the Institute for the Blind in Nottingham. Early in the 19th century a certain Mary Chambers who was afflicted with blindness, but who nevertheless had succeeded in obtaining a complete education and who was extremely charitably-minded towards her fellow sufferers, established in this house a Training School and Home for the Blind. Her work progressed exceedingly and by her death in 1848 it had grown to be of such dimensions that in later years it germinated and formed a nucleus for the Midland Royal Institute for the Blind which does such noble work nowadays in Chaucer Street. The solicitors' offices, number 34, are built upon the vista of a fine old late 18th century or early 19th century house on the other side of the road which until its demolition in 1926 was used as a boarding house. This is the last but one of the vistas in Nottingham the latest of course being that in Castle Gate. Carey's Chapel, at present used as the Theosophical Hall, is not a beautiful structure, but it is one of extreme religious historical value. It was built in 1724 by Cornelius Launder who sold it to the Anabaptists for £100. This chapel then, having been built in 1724 and being the oldest Baptist chapel in this neighbourhood, was sold in 1815 to the Scotch Baptists, but not before, on May 30th and 31st, 1792, William Carey had preached his marvellous sermon which led to the foundation of the Baptist Missionary Society. The Rev. William Carey, D.D.,was born in 1761 and was of very humble origin. He became a local preacher, a village pastor and later a minister at Leicester. He went as a missionary to India where he spent forty years in missionary work and in educational work amongst the natives, but in 1792 he attended a conference of seventeen ministers in Nottingham in the course of which he preached this wonderful sermon which is an epoch marking the event in religious history. Collin's Alms Houses. The building was demolished in the 1950s despite considerable opposition. Collin's Alms Houses are undoubtedly one of the finest architectural compositions of the city and it is a thousand pities that they are to be shorn of a portion of their forecourt and so lose the beauty of their setting. This architectural success is obtained by very simple means and is much enhanced by the delightful pitch of the roof. What little ornament is used is concentrated on the exquisite work of the date-stone facing Park Street, the armorial achievement facing Friar Lane and the beautiful sundial towards Houndsgate, and the delightful way in which the whole block of buildings is bound together by its string course will at once be noticed. The block of buildings was built in 1709 by T. Smith the great banker who was acting as trustee under the will of Abel Collin. Originally the charity was for twenty-four tenants and in addition to a house, each beneficiary was provided with a small pension and a supply of coals. 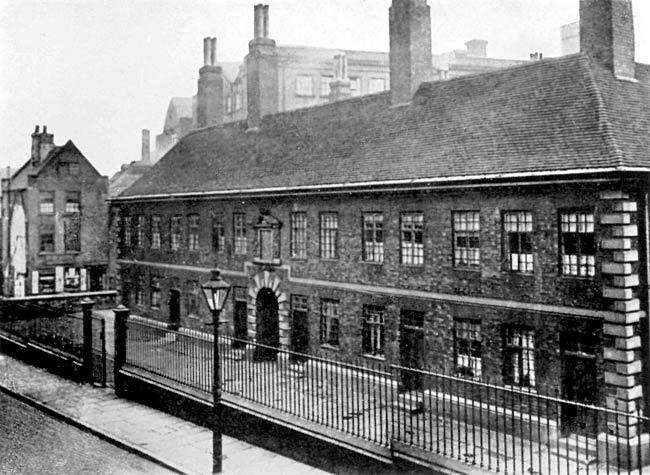 So well has the trust been managed that not only have the number of houses in Park Street been increased by a second block facing Houndsgate, but other alms houses have been erected in Carrington Street, and many other charities have been established with the increased and ever increasing income from the estate.